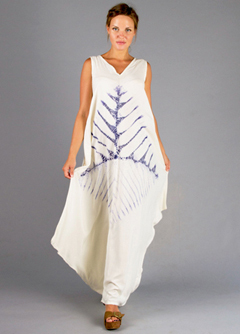 Fillyboo is famous for their irreverent, laid-back, bohemian styles. Their quirky product names and unconventional photo shoots have won them a loyal following over the years. Designer and founder, Pippa, grew up in Sydney's northern beaches and launched Fillyboo back in 2004. The most popular style in the Fillyboo collection must be the 'Story Of' maxi dress. Although available in many colours and prints, the navy chevron is the most famous. With the success of her maternity line, Pippa launched her 'Dreamfeed' nursing line allowing discreet breastfeeding access with the boho styles. We have a quick Q & A with Pippa. What is your favourite pregnant celebrity moment? 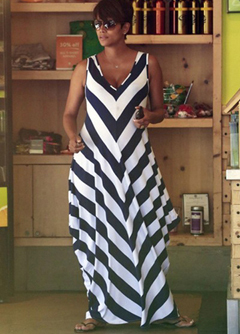 I am a little biased… it would have to be when Halle Berry wore our Story Of Maxi Dress when she was pregnant in 2014. I was so in shock when I saw it. She looked amazing, just casually out and about with her family and enjoying life, (in a Fillyboo dress! ), and of course, I loved her even more after that. If you could raid someone's wardrobe, whose would it be? If I were to be cliche it would be 70's rock starlet Stevie Nicks. I also have extreme jealously of those who were at Woodstock or saw Cat Stevens live in his hey day. I wish I was born in time for that era! But, closer to home, I would want to raid my mums wardrobe. She was, and is, an inspirational dresser. She pushes all sorts of boundaries. Each day is a new day and a new audience as far as she is concerned! When I was younger, on occasion, my sister and I would refuse to get out of the car with her.. on account of her get-up. Now looking back, her daily dressing was more than just the clothes and the fashion trends, it was about her personality and creativity and that she felt confident enough to express herself. I idolise that concept, and it inspires me everyday. So many things! We are currently expanding our maternity and nursing brand in the USA and also have plans to open a flagship concept store in Sydney towards the end of 2016. We are launching our first women's collection for SS16 this week. This new collection is such a natural progression for us after listening to our customers. We are very excited to be showing this new and youthful side of the brand and are hoping that it strikes a chord with our loyal customer base. Thank you so much Queenbee for being such a wonderful support to our brand. We have loved working together for the past 8 years and are looking forward to celebrating many more years together!